i'm a not for having candles all over burning (safely) and most of the time i have to go the cheaper route by buying what i can at the dollar store, you get a wide selection and the dollar store but the quality is never there. Still for price you cant complain? at least i didn't until i was invited to a part light party and purchased some itmes. Not to mention that candles from the dollar store have lead in their wicks and you dont want that for your family. Is shopping in the PartyLite online store here is my dealers (Niagara Region) website. HERE. The other is that for the June Guests of a online party or book where the party sales are 250 or more. Each guest that has spent 50 before tax's or shipping can get the BOGO deals on all candle products. If you are a host/ess depending on what your party sales are you get free product. 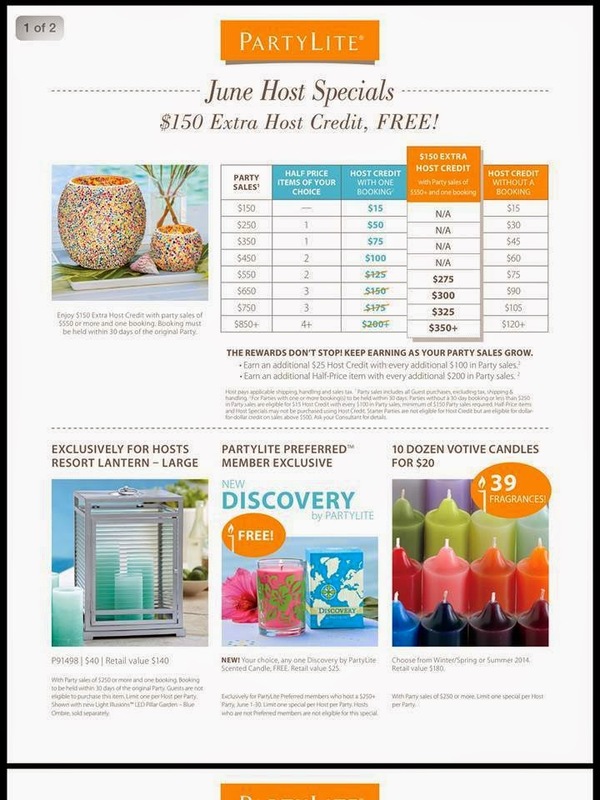 Example if you have a 250 dollar party before taxs you get 50 dollars in free product and 1 half priced item up to 60 dollars .PartyLite also has different host specials so that normally includes a free item as well. Next month is double rewards Month so with a 550 party before tax's or shipping host/ess will get 275 dollars in free product 2 half priced items as well as a 1 of the specials..
*This post was created by me, i was not given any free products to say my decision and i created this post on my own..
What candles do you burn? I have heard good things about Partylite candles. Thank you for the hosting information. Thanks for sharing! Definitely another good alternative. Cool I'll have to look this up. Great post! I love candles. I have them in every room of my house they make the house smell so good. I really like that lantern int he picture. Partylite does make good quality candles! I used to buy them all the time! It's always nice to go for quality and looks like party lite also have nice designs. Well I use battery operated candles here, flameless because of safety concerns but I also like to have candles on my display area they give a very soothing ambience and this candles looks perfect for me. I have never heard of party light but those pictures look pretty. I will check them out. I've heard about great things about them..Hope someone brings this to Manila. Party Lite products are so well made. I have many of them and love them all! My sister use to sell Party lite candles. They are great quality candles and I love them. Thanks for sharing. Party lite candles are my favorite candles, by far. I love them. PartyLite also offers LED lights as well. Sounds like an amazing brand! Thank you for sharing, I will look into them! This might sound creepy but I live burning candles, scented candle of course. I just love relaxing and inhaling the beautiful aroma. I will definitely check them out. I have never head of that company before. They look like they have a great products. I've heard of party lite before. So many different choices of candles!